The Kingdom of Georgia (Georgian: საქართველოს სამეფო), also known as the Georgian Empire, was a medieval Eurasian monarchy which emerged circa 1008 AD. It reached its Golden Age of political and economic strength during the reign of King David IV and Queen Tamar the Great from 11th to 13th centuries. Georgia became one of the pre-eminent nations of the Christian East, her pan-Caucasian empire stretching, at its largest extent, from Eastern Europe and the North Caucasus to the northern portion of Iran and Anatolia, while also maintaining religious possessions abroad, such as the Monastery of the Cross in Jerusalem and the Monastery of Iviron in Greece. It was the principal historical precursor of present-day Georgia. The Kingdom of Georgia from 1184–1230, at the peak of its territorial expansion. Various Byzantine and Sassanian coins were minted until the 12th century. Dirham came into use after 1122. 1the full title of the Georgian monarchs after 1124 was "King of Kings, Autocrat of all the East and the West, Sword of the Messiah, King of Abkhazians, King of Iberians, King of Kakheti and Heretians, King of Armenians, Possessor of Shirvan." Lasting for several centuries, the kingdom fell to the Mongol invasions in the 13th century, but managed to re-assert sovereignty by the 1340s. The following decades were marked by Black Death, as well as numerous invasions under the leadership of Timur, who devastated the country's economy, population, and urban centers. The Kingdom's geopolitical situation further worsened after the fall of the Byzantine and then Empire of Trebizond. As a result of these processes, by the end of the 15th century Georgia turned into a fractured entity. Renewed incursions by Timur from 1386, and the later invasions by the Kara Koyunlu and Ak Koyunlu led to the final collapse of the kingdom into anarchy by 1466 and the mutual recognition of its constituent kingdoms of Kartli, Kakheti and Imereti as independent states between 1490 and 1493 – each led by a rival branch of the Bagrationi dynasty, and into five semi-independent principalities – Odishi, Guria, Abkhazia, Svaneti, and Samtskhe – dominated by their own feudal clans. In struggle against the Arab occupation, Iberian princes of Bagrationi dynasty came to rule over Tao-Klarjeti, the former southern provinces of Iberia, and established Kouropalatate of Iberia as a nominal vassal of the Byzantine Empire. Bagrationi's continued fighting for the central Georgian land, known as Kartli, contested also by the Kingdom of Abkhazia, the Arab emirs of Tbilisi and even by Kakhetian and Armenian Bagratid rulers of Tashir-Dzoraget. The restoration of the Iberian kingship begins in 888, however Bagrationi dynasty failed to maintain the integrity of their kingdom, which was actually divided between the three branches of the family with the main branch retaining in Tao and another controlling Klarjeti. An Arab incursion into western Georgia was repelled by Abkhazians jointly with Lazic and Iberian allies in 736. The successful defense against the Arabs, and the increasingly expansionist tendencies of the kingdom to the east and the struggle against Byzantium, fighting for the hegemony within the Georgian territories speed up the process of unification of Georgian states into a single feudal monarchy. 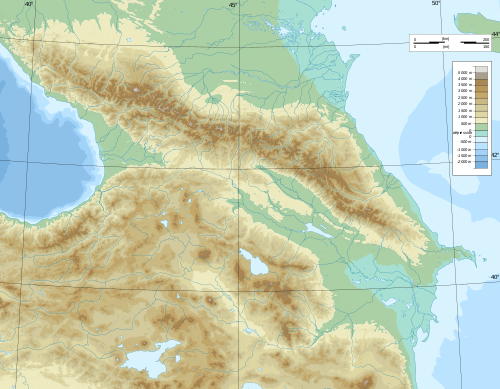 In 9th century western Georgian Church broke away from Constantinople and recognized the authority of the Catholicate of Mtskheta; language of the church in Abkhazia shifted from Greek to Georgian, as Byzantine power decreased and doctrinal differences disappeared. Map of Caucasus region at 1000 AD before death of David III of Tao. At the end of the 10th century David III of Tao invaded the Kartli and gave it to his foster-son Bagrat III and installed his father Gurgen as his regent, who was also crowned as "King of the Iberians" in 994. Through his mother Gurandukht, sister of the childless Abkhazian king Theodosius III (c. 975-978), Bagrat was a potential heir to the realm of Abkhazia. Kingdom of Abkhazia was engulfed into complete chaos and feudal warfare under the rule of Bagrat's uncle Theodosius the Blind, a weak and inauspicious king. In 978, the former duke of Kartli, Ivane Marushisdze, aided by David III, forced Theodosius to abdicate the throne in favour of his nephew Bagrat. The latter proceeded to Kutaisi to be crowned King of the Abkhazia. Bagrat's descent from both Bagratid and Abkhazian dynasties made him an acceptable choice for the nobles of the realm who were growing weary of internecine quarrels. In 1008, Gurgen died, and Bagrat succeeded him as "King of the Iberians", thus becoming the first King of a unified realm of Abkhazia and Iberia. After he had secured his patrimony, Bagrat proceeded to press a claim to the easternmost Georgian kingdom of Kakheti-Hereti and annexed it in or around 1010, after two years of fighting and aggressive diplomacy. Anxious to create more stable and centralized monarchy, Bagrat eliminated or at least diminished the autonomy of the dynastic princes. In his eyes, the most possible internal danger came from the Klarjeti line of the Bagrationi. To secure the succession to his son, George I, Bagrat lured his cousins, on pretext of a reconciliatory meeting and threw them in prison in 1011. Their possessions passed to Bagrat and his progeny. Their children – Bagrat, son of Sumbat, and Demetre, son of Gurgen – fled to Constantinople from where they would try to retrieve patrimonial lands with the Byzantine aid, for the last time in 1032, but to no avail. Bagrat's reign, a period of uttermost importance in the history of Georgia, brought about the final victory of the Georgian Bagratids in the centuries-long power struggles. Bagrat's foreign policy was generally peaceful and the king successfully manoeuvred to avoid the conflicts with both the Byzantine and Muslim neighbours even though David's domains of Tao remained in the Byzantine and Tbilisi in the Arab hands. The major political and military event during George I’s reign, a war against the Byzantine Empire, had its roots back to the 990s, when the Georgian prince David III of Tao, following his abortive rebellion against Emperor Basil II, had to agree to cede his extensive possessions in Tao to the emperor on his death. All the efforts by David’s stepson and George’s father, Bagrat III, to prevent these territories from being annexed to the empire went in vain. Young and ambitious, George launched a campaign to restore the Curopalates’ succession to Georgia and occupied Tao in 1015–1016. Byzantines were at that time involved in a relentless war with the Bulgar Empire, limiting their actions to the west. But as soon as Bulgaria was conquered, Basil II led his army against Georgia in 1021. An exhausting war lasted for two years, and ended in a decisive Byzantine victory, forcing George to agree to a peace treaty, in which George had not only to abandon his claims to Tao, but to surrender several of his southwestern possessions, later reorganized into theme of Iberia, to Basil and to give his three-year-old son, Bagrat IV, as hostage. The young child Bagrat IV spent the next three years in the imperial capital of Constantinople and was released in 1025. After George I's death in 1027, Bagrat, aged eight, succeeded to the throne. By the time Bagrat IV became king, the Bagratids’ drive to complete the unification of all Georgian lands had gained irreversible momentum. The kings of Georgia sat at Kutaisi in western Georgia from which they ran all of what had been the Kingdom of Abkhazia and a greater portion of Iberia; Tao had been lost to the Byzantines while a Muslim emir remained in Tbilisi and the kings of Kakheti and Hereti obstinately defended their autonomy in easternmost Georgia. Furthermore, the loyalty of great nobles to the Georgian crown was far from stable. During Bagrat's minority, the regency had advanced the positions of the high nobility whose influence he subsequently tried to limit when he assumed full ruling powers. Simultaneously, the Georgian crown was confronted with two formidable external foes: the Byzantine Empire and the resurgent Seljuq Turks. The second half of the 11th century was marked by the strategically significant invasion of the Seljuq Turks, who by the end of the 1040s had succeeded in building a vast empire including most of Central Asia and Persia. The Seljuk threat prompted the Georgian and Byzantine governments to seek a closer cooperation. To secure the alliance, Bagrat's daughter Maria married, at some point between 1066 and 1071, to the Byzantine co-emperor Michael VII Ducas. The Seljuqs made their first appearances in Georgia in the 1060s, when the sultan Alp Arslan laid waste to the south-western provinces of the Georgian kingdom and reduced Kakheti. These intruders were part of the same wave of the Turkish movement which inflicted a crushing defeat on the Byzantine army at Manzikert in 1071. Although the Georgians were able to recover from Alp Arslan's invasion and even securing the Tao (theme of Iberia), by the help of Byzantine governor of Georgian origin, Gregory Pakourianos. On this occasion, George II was bestowed with the Byzantine title of Caesar, granted the fortress of Kars and put in charge of the Imperial Eastern limits. Watching his kingdom slip into chaos, George II ceded the crown to his 16-year-old son David IV in 1089. King David IV proved to be a capable statesman and military commander. As he came of age under the guidance of his court minister, George of Chqondidi, David IV suppressed dissent of feudal lords and centralized the power in his hands to effectively deal with foreign threats. In 1089–1100, he organized small detachments to harass and destroy isolated Seljuk troops and began the resettlement of desolate regions. By 1099 David IV's power was considerable enough that he was able to refuse paying tribute to Seljuqs. In 1103 a major ecclesiastical congress known as the Ruis-Urbnisi Synod was held. Next year, David's supporters in the eastern Georgian province of Kakheti captured the local king Aghsartan II (c.1102–1104), a loyal tributary of the Seljuk Sultan, and reunited the area with the rest of Georgia. Following the annexation of Kakheti, in 1105, David routed a Seljuk punitive force at the Battle of Ertsukhi, leading to momentum that helped him to secure the key fortresses of Samshvilde, Rustavi, Gishi, and Lori between 1110 and 1118. After pillaging the County of Edessa, Seljuqid commander Ilghazi made peace with the Crusaders. In 1121 he went north towards Armenia and with supposedly up to 250 000 - 350 000 troops, including men led by his son-in-law Sadaqah and Sultan Malik of Ganja, he invaded Georgia. To strengthen his army, King David launched a major military reform in 1118–1120 and resettled several thousand Kipchaks from the northern steppes to frontier districts of Georgia. In return, the Kipchaks provided one soldier per family, allowing King David to establish a standing army in addition to his royal troops (known as Monaspa). The new army provided the king with a much-needed force to fight both external threats and internal discontent of powerful lords. The Georgian-Kipchak alliance was facilitated by David's earlier marriage to the Khan's daughter. Starting in 1120, King David began a more aggressive policy of expansion. He entered the neighbouring Shirvan and took the town of Qabala. In the winter of 1120–1121 the Georgian troops successfully attacked the Seljuk settlements on the eastern and southwestern approaches to the Transcaucasus. Muslim powers became increasingly concerned about the rapid rise of a Christian state in southern Caucasia. In 1121, Sultan Mahmud b. Muhammad (c. 1118–1131) declared a holy war on Georgia. However, 12 August 1121, King David routed the enemy army on the fields of Didgori, with fleeing Seljuq Turks being run down by pursuing Georgian cavalry for several days. A huge amount of booty and prisoners were captured by David's army, which had also secured Tbilisi, the last Muslim enclave remaining from the Arab occupation, in 1122 and moved the Georgian capital there and inaugurated Georgia's Golden Age. A well-educated man, he preached tolerance and acceptance of other religions, abrogated taxes and services for the Muslims and Jews, and protected the Sufis and Muslim scholars. In 1123, David's army liberated Dmanisi, the last Seljuk stronghold in southern Georgia. In 1124, David finally conquered Shirvan and took the Armenian city of Ani from the Muslim emirs, thus expanding the borders of his kingdom to the Araxes basin. Armenians met him as a liberator providing some auxiliary force for his army. It was when the important component of "Sword of the Messiah" appeared in the title of David the Builder. David IV founded the Gelati Academy, which became an important center of scholarship in the Eastern Orthodox Christian world of that time. Due to the extensive work carried out by the Gelati Academy, people of the time called it "a new Hellas" and "a second Athos". David also played a personal role in reviving Georgian religious hymnography, composing the Hymns of Repentance, a sequence of eight free-verse psalms. In this emotional repentance of his sins, David sees himself as reincarnating the Biblical David, with a similar relationship to God and to his people. His hymns also share the idealistic zeal of the contemporaneous European crusaders to whom David was a natural ally in his struggle against the Seljuks. The kingdom continued to flourish under Demetrius I, the son of David. Although his reign saw a disruptive family conflict related to royal succession, Georgia remained a centralized power with a strong military. In 1139, he raided the city of Ganja in Arran and brought the iron gate of the defeated city to Georgia and donated it to Gelati Monastery at Kutaisi, western Georgia. Despite this brilliant victory, Demetrius could hold Ganja only for a few years. A talented poet, Demetrius also continued his father's contributions to Georgia's religious polyphony. The most famous of his hymns is Thou Art a Vineyard. Demetrius was succeeded by his son George III in 1156, beginning a stage of more offensive foreign policy. The same year he ascended to the throne, George launched a successful campaign against the Seljuq sultanate of Ahlat. He freed the important Armenian town of Dvin from Eldiguzid vassalage and was thus welcomed as a liberator in the area. Eldiguz formed a coalition with other Seljuqids in the beginning of the 1160s to fight against the Georgians, and in 1163. the allies inflicted a defeat on king George III of Georgia. The Seljuqid rulers were jubilant, and they prepared for a new campaign. However, this time they were forestalled by George III, who marched into Arran at the beginning of 1166, occupied a region extending to faraway cities as Nakhchivan and Beylagan, devastated the land and returned with prisoners and booty. There seemed to be no end to the war between George III and atabeg Eldiguz. But the belligerents were exhausted to such an extent that Eldiguz proposed an armistice. George had no alternative but to make concessions. Eldiguz restored Ani to its former rulers, the Shaddadids. In 1167, George marched to defend his vassal Shah Akhsitan of Shirvan against the Rus' and Kipchak assaults and strengthened the Georgian dominance in the area. George gave his daughter Rusudan, in marriage, to Manuel Komnenos, the son of Emperor Andronikos I Komnenos. In 1173, Atabeg Eldiguz began another campaign against Georgia but he was defeated. Atabeg's troops retreated and Eldiguz died in 1174 in Nakhchivan. In 1177, the nobles rose in rebellion but were suppressed. The following year, King George III ceded the throne to his daughter Tamar, but remained coregent until his death in 1184. Kingdom of Georgia under Queen Tamar's reign. The unified monarchy maintained its precarious independence from the Byzantine and Seljuk empires throughout the 11th century, and flourished under David IV the Builder (c. 1089–1125), who repelled the Seljuk attacks and essentially completed the unification of Georgia with the re-conquest of Tbilisi in 1122. In spite of repeated incidents of dynastic strife, the kingdom continued to prosper during the reigns of Demetrios I (c.1125–1156), George III (c.1156–1184), and especially, his daughter Tamar (c.1184–1213). With the decline of Byzantine power and the dissolution of the Great Seljuk Empire, Georgia became one of the pre-eminent nations of the region, stretching, at its largest extent, from present-day Southern Russia to Northern Iran, and westwards into Anatolia. The Kingdom of Georgia brought about the Georgian Golden Age, which describes a historical period in the High Middle Ages, spanning from roughly the late 11th to 13th centuries, when the kingdom reached the zenith of its power and development. The period saw the flourishing of medieval Georgian architecture, painting and poetry, which was frequently expressed in the development of ecclesiastic art, as well as the creation of first major works of secular literature. It was a period of military, political, economical and cultural progress. It also included the so-called Georgian Renaissance (also called Eastern Renaissance), during which various human activities, forms of craftsmanship and art, such as literature, philosophy and architecture thrived in the kingdom. The successes of his predecessors were built upon by Queen Tamar, daughter of George III, who became the first female ruler of Georgia in her own right and under whose leadership the Georgian state reached the zenith of power and prestige in the Middle Ages. She not only shielded much of her Empire from further Turkish invasions but successfully pacified internal tensions, including a coup organized by her Russian husband Yury Bogolyubsky, prince of Novgorod. In 1199, Tamar's armies led by two Christianised Kurdish generals, Zakare and Ivane Mkhargrzeli, dislodged the Shaddadid dynasty from Ani. At the beginning of the 13th century Georgian armies overran fortresses and cities towards the Ararat Plain, reclaiming one after another fortresses and districts from local Muslim rulers: Bjni, Amberd and all the towns on their way in 1201. Alarmed by the Georgian successes, Süleymanshah II, the resurgent Seljuqid sultan of Rûm, rallied his vassal emirs and marched against Georgia, but his camp was attacked and destroyed by Tamar's husband David Soslan at the Battle of Basian in 1203 or 1204. Exploiting her success in this battle, between 1203-1205 Georgians seized the town of Dvin and entered Akhlatshah possessions twice and subdued the emirs of Kars, Akhlatshahs, Erzurum and Erzincan. In 1206 the Georgian army, under the command of David Soslan, captured Kars (vassal of the Saltukids in Erzurum) and other fortresses and strongholds along the Araxes. This campaign was evidently started because the ruler of Erzerum refused to submit to Georgia. The emir of Kars requested aid from the Akhlatshahs, but the latter was unable to respond, it was taken over by the Ayyubids In 1207. By 1209 Georgia challenged Ayyubid rule in eastern Anatolia. Georgian army besieged Akhlat. In response Ayyubid Sultan al-Adil assembled and personally led large Muslim army that included the emirs of Homs, Hama and Baalbek as well as contingents from other Ayyubid principalities to support al-Awhad. During the siege, Georgian general Ivane Mkhargrdzeli accidentally fell into the hands of the al-Awhad on the outskirts of Akhlat. the latter demanded for his release a thirty-year truce. The Georgians had to lift the siege and conclude peace with the sultan. This brought the struggle for the Armenian lands to a stall, leaving the Lake Van region to the Ayyubids of Damascus. Medieval Georgian monasteries in Balkans and Near East. Among the remarkable events of Tamar's reign was the foundation of the Empire of Trebizond on the Black Sea in 1204. This state was established in the northeast of the crumbling Byzantine Empire with the help of the Georgian armies, which supported Alexios I of Trebizond and his brother, David Komnenos, both of whom were Tamar's relatives. Alexios and David were fugitive Byzantine princes raised at the Georgian court. According to Tamar's historian, the aim of the Georgian expedition to Trebizond was to punish the Byzantine emperor Alexios IV Angelos for his confiscation of a shipment of money from the Georgian queen to the monasteries of Antioch and Mount Athos. Tamar's Pontic endeavor can also be explained by her desire to take advantage of the Western European Fourth Crusade against Constantinople to set up a friendly state in Georgia's immediate southwestern neighborhood, as well as by the dynastic solidarity to the dispossessed Comnenoi. As a retribution for the attack on Georgian-controlled city of Ani, where 12,000 Christians were massacred in 1208, Georgia's Tamar the Great invaded and conquered the cities of Tabriz, Ardabil, Khoy, Qazvin and others along the way to Gorgan in northeast Persia. The country's power had grown to such extent that in the later years of Tamar's rule, the Kingdom was primarily concerned with the protection of the Georgian monastic centers in the Holy Land, eight of which were listed in Jerusalem. Saladin's biographer Bahā' ad-Dīn ibn Šaddād reports that, after the Ayyubid conquest of Jerusalem in 1187, Tamar sent envoys to the sultan to request that the confiscated possessions of the Georgian monasteries in Jerusalem be returned. Saladin's response is not recorded, but the queen's efforts seem to have been successful. Ibn Šaddād furthermore claims that Tamar outbid the Byzantine emperor in her efforts to obtain the relics of the True Cross, offering 200,000 gold pieces to Saladin who had taken the relics as booty at the battle of Hattin – to no avail, however. Mongol invasion of Georgia and battle of Khunan. George IV continued Tamar's policy of strengthening of the Georgian feudal state. Georgia's largely isolationist policies had allowed it to accumulate a powerful army and a very large concentration of knights. He put down the revolts in neighbouring Muslim vassal states in the 1210s and began preparations for a large-scale campaign against Jerusalem to support the Crusaders in 1220. However, the Mongol approach to the Georgian borders made the Crusade plan unrealistic, the reconnaissance force under the Mongols Jebe and Subutai destroyed the entire Georgian army in two successive battles, in 1221–1222, most notably the Battle of Khunan. Georgian Illumination from the Djruchi II Four Gospels, 12-13th Centuries. The miniature depicting "Georgian knights". Georgians suffered heavy losses in this war and the King George IV, himself was severely wounded. The Kingdom of Georgia itself was torn by internal dissent and was unprepared for such an ordeal. The struggle between the nobility and the crown increased. In 1222, King George appointed his sister Rusudan as a co-regent and died later that year. Queen Rusudan (c. 1223–1245) proved a less capable ruler, and domestic discord intensified on the eve of foreign invasion. This offensive, which would prove the ruin of Georgia, was preceded by the devastating conflict with Khwarazm ruler Jalal ad-Din Mingburnu, the son of the last ruler of Khwarazm, who was defeated by the Mongols and now led his Khwaras mian army to Caucasus. The Georgians suffered bitter defeat at the Battle of Garni, and the royal court with Queen Rusudan moved to Kutaisi, when the Georgian capital Tbilisi was besieged by the Khwarezmians. The victorious Khwarezmid soldiers sacked Tbilisi and massacred its Christian population and terminated Georgia's "Golden Age". Jalal al-Din continued devastating Georgian regions until 1230, when the Mongols finally defeated him. In 1235–1236, Mongol forces, unlike their first raid in 1221, appeared with the sole purpose of conquest and occupation and easily overran the already devastated Kingdom. Queen Rusudan fled to the security of western Georgia, while the nobles secluded themselves in their fortresses. By 1240 all the country was under the Mongol yoke. Forced to accept the sovereignty of the Mongol Khan in 1242, Rusudan had to pay an annual tribute of 50,000 gold pieces and support the Mongols with a Georgian army. Fearing that her nephew David VII of Georgia would aspire to the throne, Rusudan held him prisoner at the court of her son-in-law, the sultan Kaykhusraw II, and sent her son David VI of Georgia to the Mongol court to get his official recognition as heir apparent. She died in 1245, still waiting for her son to return. Map of Kingdom of Georgia during Mongol invasions, 1245 AD. 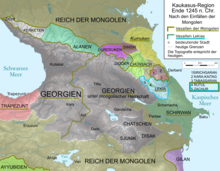 The Mongols created the "Vilayet of Gurjistan", which included Georgia and the whole South Caucasus, where they ruled indirectly, through the Georgian monarch, the latter to be confirmed by the Great Khan upon his/her ascension. Following the death of Queen Rusudan in 1245, an interregnum began during which the Mongols divided the Caucasus into eight tumens. Exploiting the complicated issue of succession, the Mongols had the Georgian nobles divided into two rival parties, each of which advocated their own candidate to the crown. These were David VII "Ulu", an illegitimate son of George IV, and his cousin David VI "Narin", son of Rusudan. After a failed plot against the Mongol rule in Georgia (1245), Güyük Khan made, in 1247, both pretenders co-kings, in eastern and western parts of the kingdom respectively, they also carved out the region of Samtskhe and placed it under the direct control of the Ilkhanate. The system of tumens was abolished, but the Mongols closely watched the Georgian administration in order to secure a steady flow of taxes and tributes from the subject peoples, who were also pressed into the Mongol armies. Georgians attended all major campaigns of the Ilkhanate and aristocrats' sons served in kheshig. The period between 1259 and 1330 was marked by the struggle of the Georgians against the Mongol Ilkhanate for full independence. The first anti-Mongol uprising started in 1259 under the leadership of King David Narin who in fact waged his war for almost thirty years. The Anti-Mongol strife went on under the Kings Demetrius II (c. 1270–1289) and David VIII (c. 1293–1311). Western and Eastern Georgia around 1311 AD. Demetrius was executed by the Mongols in 1289, and the little prince George was carried to Samtskhe to be reared at the court of his maternal grandfather, Beka I Jaqeli. In 1299, the Ilkhanid khan Ghazan installed him as a rival ruler to George's elder brother, the rebellious King David VIII. However, George's authority did not extend beyond the Mongol-protected capital Tbilisi, so George was referred to during this period as "The Shadow King of Tbilisi". In 1302, he was replaced by his brother, Vakhtang III. After the death of both his elder brothers – David and Vakhtang – George became a regent for David's son, George VI, who died underage in 1313, allowing George V to be crowned king for a second time. Having initially pledged his loyalty to the Il-khan Öljaitü, he began a program of reuniting the Georgian lands. In 1315, he led the Georgian auxiliaries to suppress an anti-Mongol revolt in Asia Minor, an expedition that would prove to be the last in which the Georgians fought in the Mongol ranks. In 1320, he drove the marauding Alans out of the town Gori and forced them back to the Caucasus Mountains. He pursued a shrewd and flexible policy aimed at throwing off the Mongol yoke and restoring the Georgian kingdom. He established close relations with the Mongol khans and succeeded in acquiring authority to personally collect taxes on their behalf. Using Mongol force to his advantage, In 1329, George laid siege to Kutaisi, western Georgia, reducing the local king Bagrat I the Little to a vassal prince. King George was on friendly terms with the influential Mongol prince Chupan, who was executed by Abu Sa'id Khan in 1327. Subsequently, Iqbalshah, son of Kutlushah, was appointed to be Mongol governor of Georgia (Gurjistan). In 1334 he reasserted royal authority over the virtually independent principality of Samtskhe and returned the Empire of Trebizond into Georgia's sphere of influence. In 1334, Shaykh Hasan of the Jalayir was appointed as governor of Georgia by Abu Sai'd. However, George soon took advantage of the civil war in the Il-Khanate, where several khans were overthrown between 1335 and 1344, and drove the last remaining Mongol troops out of Georgia. The following year he ordered great festivities on the Mount Tsivi to celebrate the anniversary of the victory over the Mongols, and massacred there all oppositionist nobles. Having restored the kingdom's unity, he focused now on cultural, social and economic projects. He changed the coins issued by Ghazan khan with the Georgian ones, called George's tetri. Between 1325 and 1338, he worked out two major law codes, one regulating the relations at the royal court and the other devised for the peace of a remote and disorderly mountainous district. Under him, Georgia established close international commercial ties, mainly with the Byzantine Empire, but also with the great European maritime republics, Genoa and Venice. There was a period of reunion and revival under George V the Brilliant, but the eight onslaughts of the Turco-Mongol conqueror Timur between 1386 and 1403 dealt a great blow to the Georgian kingdom. Timur's first appearance in the Caucasus was a response to Khan Tokhtamysh’s marauding inroad into Northern Iran through the Caucasian lands in 1385. In late autumn 1386, a huge army of Timur attacked Georgia. Timur officially proclaimed his invasions to be jihad against the region's non-Muslims. Tbilisi was besieged and taken on 22 November 1386, after a fierce fight. The city was pillaged and Bagrat V and his family were imprisoned. Taking advantage of this disaster, the royal vassal Duke Alexander of Imereti proclaimed himself an independent ruler and was crowned king of Imereti at the Gelati Monastery in 1387. Georgian resistance prompted a renewed attack by the Turco-Mongol armies. Bagrat's son and successor, George VII, put up a stiff resistance and had to spend much of his reign (1395–1405) fighting the Timurid invasions. Timur personally led most of these raids to subdue the recalcitrant Georgian monarch. Although he was not able to establish a firm control over Georgia, the country suffered a blow from which it never recovered. By the time George VII was forced to accept Timur's terms of peace and agree to pay tribute, he was a master of little more than gutted towns, ravaged countryside and a shattered monarchy. Map of Caucasus Region 1405. After the devastating invasions by Timur and subsequent enfeeblement of the Kingdom of Georgia, it soon faced a new threat. Timur's death in 1405 marked the beginning of the end of his Empire, unified only by fear and blood of the subjected peoples. Turkomans, particularly the Kara Koyunlu clan, were among the first to rebel against Shah Rukh who ruled most of the Persia and Mawerannahr. Qara Yusuf, ruler of the Kara Koyunlu, defeated Shah Rukh, captured Baghdad, and repulsed Timurids from western Persia. After they established themselves as the new leading power in the middle east. They took advantage of the temporary weakness of Georgians and launched attacks against them, apparently in which, George VII of Georgia was killed. Constantine I of Georgia, fearing further encroachment, allied himself with the Shirvanshah Ibrahim I to counter Turkoman advance and engaged them in the Battle of Chalagan, in which he was defeated and taken captive. In captivity Constantine behaved very proudly, which infuriated Qara Yusuf to such an extent, that he ordered his, his half-brother David's and 300 Georgian nobles' execution. Kara Yusuf put Constantine to death by his own hand. Alexander I of Georgia who sought to strengthen and restore his declining Kingdom, faced constant invasions by the tribal Turkomans. Alexander re-conquered Lori from the Turkomans in 1431, which was of great importance in securing of the Georgian borders. Around 1434/5, Alexander encouraged the Armenian prince Beshken II Orbelian to attack the Kara Koyunlu clansmen in Siunia and, for his victory, granted him Lori under terms of vassalage. In 1440, Alexander refused to pay tribute to Jahan Shah of the Kara Koyunlu. In March, Jahan Shah surged into Georgia with 20,000 troops, destroyed the city of Samshvilde and sacked the capital city Tbilisi. He massacred thousands of Christians, put heavy indemnity on Georgia, and returned to Tabriz. He also mounted a second military expedition against Georgia in 1444. His forces met those of Alexander's successor, King Vakhtang IV at Akhaltsikhe, but the fighting was inconclusive and Jahan Shah returned to Tabriz once more. As a result of foreign and internal struggles unified Kingdom of Georgia stopped to exist after 1466 and was subdivided into several political units. Kara Koyunlu tribal confederation was destroyed by Aq Qoyunlu, their kin tribesmen who formed another confederation, which was similar in many ways to its predecessor. Aq Qoyunlu Turkomans naturally took advantage of the Georgian fragmentation. Georgia was at least twice attacked by Uzun Hasan, the prince of the Aq Qoyunlu in 1466, 1472 and possibly 1476-7. Bagrat VI of Georgia, temporary ruler of most of Georgia at the time, had to make peace with the invaders, by abandoning Tbilisi to the enemy. It was only after Uzun Hasan's death (1478) when the Georgians were able to recover their capital. In the winter of 1488, the Ak Koyunlu Turkomans led by Halil Bey attacked Georgia's capital Tbilisi, and took the city after a long-lasted siege in February 1489. Alexander II of Imereti, another pretender to the throne, took advantage of the Aq Qoyunlu Turkoman invasion of Kartli, and seized control of Imereti. Occupation of the capital did not last long and Constantine II of Georgia was able to repel them, but it was still costly to Georgians. Ismail I, founder of the Safavid dynasty, formed an alliance with the Georgians in 1502 and decisively defeated Aq Qoyunlu in the same year, destroying their state and marking the end of their invasions. Map of Caucasus Region 1460. The political split of the kingdom was speeded up by the Eristavs of Samtskhe. In 1462 Kvarkvare II Jaqeli called against the king of Georgia Uzun Hasan, the leader of the Aq Qoyunlu. His invasion was used by the viceroy of the western Georgia – Bagrat VI. In 1463 Bagrat VI defeated Giorgi VIII at Chikhori. "Dadiani, Gurieli, Abkhazians and Svans came to the conqueror and expressing the wish of all the Imerians (westerners) blessed him to be King. From that time Imereti turned into one kingdom and four Duchies or satavado. Bagrat was the king of only west Georgia for a short period. In 1466 he crossed the borders of East Georgia (Inner Kartli) and proclaimed himself King of all Georgia. In fact, he possessed only west Georgia and Inner Kartli. Giorgi VIII went to Kakheti and formed an independent Kakhetian Kingdom. Recognizing as a sovereign of Bagrat VI the grandson of Alexander I the Great – Constantine II was consolidated in the lower Kartli (Tbilisi), while Samtskhe-Saatabago became an independent principality. Map of Caucasus Region 1490. In 1477, Eristav of Odishi Vameq II Dadiani opposed Bagrat VI. He "assembled the Abkhazians and Gurians and began the raids, devastation and capturing of Imereti". The reaction of the king of Georgia was immediate. Bagrat VI attacked Odishi with the great army, defeated and subdued Vameq II Dadiani. The king of Kartli and west Georgia – Bagrat VI died in 1478. Constantine II ascended the throne of Kartli. The son of Bagrat VI – Alexander II tried to ascend the throne in west Georgia. For coronation he summoned "Dadiani, Gurieli, Sharvashidze and Gelovani", but headed with Vameq II Dadiani. who refused to support him and invited Constantine II to Western Georgia. Constantine with the help of the Eristavs of western Georgia took Kutaisi and for a short time restored the integrity of Kartli with western Georgia. The allies were planning to unite the whole Georgia and in the first place tried to join Samtskhe-Saatabago. Vameq II Dadiani with the army of west Georgia helped Constantine II in 1481 in the battle with prince and after this the King subordinated Samtskhe. Constantine II became the King of All Georgia. He "subdued Imers, Odishians and Abkhazians; Atabag served him and the Kakhetians were in his subordination. in 1483 Constantine II was defeated at Aradeti in the battle with atabag. The son of Bagrat – Alexander, later known as Alexander II took advantage of it and captured Kutaisi and was crowned as a King. Then, the new possessor of Odishi - Liparit II Dadiani invited Constantine II to West Georgia for the second time. In 1487 Constantine came to west Georgia again with the army and occupied Kutaisi and other significant fortresses with the help of Liparit II Dadiani and other great feudals of West Georgia. But he failed to fully annex west Georgia. In 1488 Yaqub b. Uzun Hasan invaded East Georgia and the king of Kartli went to fight with him. Alexander II took advantage of it and captured Kutaisi and all fortresses of Imereti again and after that "reconciled with Dadiani and Gurieli. By this act, he pacified Imereti and firmly subdued the Abkhazians and Svans". In 1490 Constantine asked a specially assembled royal court for an advice concerning restoration of the integral kingdom. The royal court advised Constantine II to postpone this struggle till the better times. After this the king of Kartli had to temporarily reconcile with the kings of Kakheti and Imereti and also prince of Samtskhe having thus formed the factual split of Georgia. Its unity was finally shattered and, by 1490/91, the once powerful monarchy fragmented into three independent kingdoms – Kartli (central to eastern Georgia), Kakheti (eastern Georgia), and Imereti (western Georgia) – each led by the rival branches of the Bagrationi dynasty, and into five semi-independent principalities – Odishi (Mingrelia), Guria, Abkhazia, Svaneti and Samtskhe – dominated by their own feudal clans. Georgian monarchs followed a policy of religious tolerance and their Christian, Muslim and Jewish subjects could feel quite comfortable. Medieval Georgia, in its political and cultural development and social structure, resembled Europe, "all the familiar terms of Western feudalism had their equivalents in the social system of medieval Georgia" obviously influenced by Byzantium. In the medieval period, Georgian feudalism or "Patronqmoba" went through three distinct phases. In the first period, taken to have lasted from the 8th to the 11th centuries, Georgian society was organized as a network of personal ties, tying the king with the nobles of various classes. By the early 9th century, Georgia had already developed a system in which homage was exchanged for benefices. Unlike the countries of medieval Europe, where the three elements of political compromise – towns, feudal lords and the church – divided power among themselves and consequently promoted the development of strong centralized nation-States, in Georgia the towns were too weak and were deprived of rights, the feudal lords were too strong, and the church was nominally subjugated to the crown and politically less active. The aristocratic élite of this period was divided into two major classes: an upper noble whose dynastic dignity and feudal quality was expressed in the terms Tavadi and Didebuli, respectively; both of these terms were synonymous, from the 11th to the 14th centuries, with Eristavi, and all three terms referred to one of the upper nobles, "a Prince". Lesser nobles, the Aznauri, were either "nobles of race" or "of patent" who acquired their status in specific charters issued by the king or a lord. The power of the feudal nobles over the peasantry also increased and the cultivators began to loss a degree of personal freedom they had formerly enjoyed. Administrative division of the medieval Kingdom of Georgia in Georgian golden age. Eristavi's (dukes) were in charge of local governing. Saeristavo (duchy) was divided into Khevi ruled by Khevistavi (in mountainous regions - Khevisberi). List of duchies at the time of reign Tamar the Great: Svaneti, Racha-Takveri; Tskhumi, Artgveti, Odishi, Kartli, Kakheti, Hereti and Samtskhe. The frontier regions were granted exceptional privileges and autonomous rights, and were governed by monapire eristavi (frontier governor). There were several frontier (sanapiro) marches estabelished specifically on southern districts: Gagi, Lore, Akhalkalaki, Artani, Panaskerti, Gachiani and Kari. For their part, towns were governed by amiri, while large cities by amirt-amiri. All these arrangements were codified and systematised in special legislation - Regulations of the Royal Court - and codes of laws. The bishops and the churches were exempted from quitrents and duties. Tribute extracted from the neighbors and war booty added to the royal treasury, giving rise to the saying that "the peasants were like nobles, the nobles like princes, and the princes like kings." During the Middle Ages, Christianity was the central element of Georgian culture. Specific forms of art were developed in Georgia for religious purposes. Among them, calligraphy, polyphonic church singing, cloisonné enamel icons, such as the Khakhuli triptych, and the "Georgian cross-dome style" of architecture, which characterizes most medieval Georgian churches. The most celebrated examples of Georgian religious architecture of the time include the Gelati Monastery and Bagrati Cathedral in Kutaisi, the Ikalto Monastery complex and Academy, and the Svetitskhoveli Cathedral in Mtskheta. Outstanding Georgian representatives of Christian culture include Euthymius of Athos (Ekvtime Atoneli, 955–1028), George of Athos (Giorgi Atoneli, 1009–1065), Arsen Ikaltoeli (11th century), and Ephrem Mtsire, (11th century). Philosophy flourished between the 11th and 13th century, especially at the Academy of Gelati Monastery, where Ioane Petritsi attempted a synthesis of Christian, aristotelician and neoplatonic thought. Tamar's reign also marked the continuation of artistic development in the country commenced by her predecessors. While her contemporary Georgian chronicles continued to enshrine Christian morality, the religious theme started to lose its earlier dominant position to the highly original secular literature. This trend culminated in an epic written by Georgia's national poet Rustaveli - The Knight in the Panther's Skin (Vepkhistq'aosani). Revered in Georgia as the greatest achievement of native literature, the poem celebrates the Medieval humanistic ideals of chivalry, friendship and courtly love. From the 10th century, Georgians had started to play a significant role in preaching Christianity in the mountains of the Caucasus. "Wherever the missions of the patriarchs of Constantinople, Rome, Alexandria, Antioch and Jerusalem failed, the Georgian Church succeeded in bringing Jesus's Cross and preaching His Gospels". This is corroborated not only by old written sources, but also by Christian architectural monuments bearing Georgian inscriptions, which are still to be seen throughout the North Caucasus in Chechnya, Ingushetia, Dagestan, North Ossetia, Kabardino-Balkaria. The golden age of Georgian monasticism lasted from the 9th to the 11th century. During that period, Georgian monasteries were founded outside the country, most notably on Mount Sinai, Mount Athos (the Iviron monastery, where the Theotokos Iverskaya icon is still located), and in Palestine. One of the primary reasons of Georgian political and military decline was the bubonic plague. It was first introduced in 1346 by the soldiers of George the Brilliant returning from a military expedition in south-western Georgia against invading Osmanli tribesmen. It is said that the plague wiped out a large part, if not half of the Georgian populace. This further weakened the integrity of the kingdom, as well as its military and logistic capabilities. Despite setbacks at the hands of Mongols, Georgia continued to produce cultural landmarks, such as these frescoes at Ubisi by Damiane - one of Georgia's distinctive medieval artists. Gelati Theotokos. The use of costly mosaics in church decorations heralded Georgia's imperial ambitions. ^ "In 1490, Constantine II summoned a special royal council that recognized the fragmentation of the Kingdom of Georgia into separate kingdoms and principalities." ^ Kakabadze 1920: 40; Jaoshvili 1984: 49. "At the beginning of the 13th century, according to the most likely estimates, the population of the realm, which in those days was almost equal in size to England and Wales, was 2400000-2500000. Of these, 1800000 lived in the area of modem Georgia (Jaoshvili 1984: 50). ^ Rayfield, Donald (2012). Edge of Empires: A History of Georgia. London: Reaktion Books. p. 129. ISBN 1780230303. ^ Paghava, Irakli; Novak, Vlastimil (2013). GEORGIAN COINS IN THE COLLECTION OF THE NATIONAL MUSEUM-NÁPRSTEK MUSEUM IN PRAGUE. Retrieved 31 May 2016. ^ Chufrin, Gennadiĭ Illarionovich (2001). The Security of the Caspian Sea Region. Stockholm, Sweden: Oxford University Press. p. 282. ISBN 0199250200. ^ Waters, Christopher P. M. (2013). Counsel in the Caucasus: Professionalization and Law in Georgia. New York City, USA: Springer. p. 24. ISBN 9401756201. ^ Suny, Ronald Grigor (1994). The Making of the Georgian Nation. Bloomington, IN, USA: Indiana University Press. p. 87. ISBN 0253209153. ^ Toumanoff, Cyril (1967). Studies in Christian Caucasian History, p. 498. Georgetown University Press. ^ (in Georgian) Javakhishvili, Ivane (1982), k'art'veli eris istoria (The History of the Georgian Nation), vol. 2, pp. 184-187. Tbilisi State University Press. ^ Rayfield, Donald (2013). Edge of Empires: A History of Georgia. Reaktion Books. p. 100. ISBN 978-1780230702. ^ Mikaberidze, Alexander (2015). Historical Dictionary of Georgia (2 ed.). Rowman & Littlefield. p. 259. ISBN 978-1442241466. ^ Eastmond, Antony (2010). Royal Imagery in Medieval Georgia. University Park, Pennsylvania, USA: Penn State Press. p. 71. ISBN 0271043911. ^ Brisku, Adrian (2013). Bittersweet Europe: Albanian and Georgian Discourses on Europe, 1878-2008. NY, USA: Berghahn Books. p. 134. ISBN 0857459856. ^ van der Zweerde, Evert (2013). Soviet Historiography of Philosophy: Istoriko-Filosofskaja Nauka. Berlin, Germany: Springer Science & Business Media. p. 140. ISBN 9401589437. ^ Kuehn 2011, p. 28. ^ Lordkipanidze & Hewitt 1987, p. 150. ^ Lordkipanidze & Hewitt 1987, p. 154. ^ Tamar's paternal aunt was the Comnenoi's grandmother on their father’s side, as it has been conjectured by Cyril Toumanoff(1940). ^ Eastmond (1998), pp. 153–154. ^ Vasiliev (1935), pp. 15–19. ^ Yar-Shater, Ehsan (2010). Encyclopaedia Iranica, Volume 2, Parts 5-8. Abingdon, United Kingdom: Routledge & Kegan Paul. p. 892. ^ Brosset, Marie-Felicite (1858). Histoire de la Géorgie depuis l'Antiquité jusqu'au XIXe siècle. France: imprimerie de l'Académie Impériale des sciences. pp. 468–472. ^ Ta'rfkh-i Shaikh Uwais (History of Shaikh Uwais), trans. and ed. J. B. van Loon, The Hague, 1954, 56-58. ^ Toumanoff, Cyril (1949–51). The Fifteenth-Century Bagratids and the Institution of Collegial Sovereignty in Georgia. Traditio 7: 174, 176-177. ^ Toumanoff, Cyril. "Armenia and Georgia," The Cambridge Medieval History, vol. 4, pp. 593–637. Cambridge England: Cambridge University Press: 1966, p. pp. 624–625. ^ IBP, Inc. (2012). Georgia Country Study Guide Volume 1 Strategic Information and Developments. Lulu.com. p. 44. ISBN 1438774435. ^ West, Barbara A. (2010). Encyclopedia of the Peoples of Asia and Oceania. New York City, NY, USA: Infobase Publishing. p. 229. ISBN 1438119135.